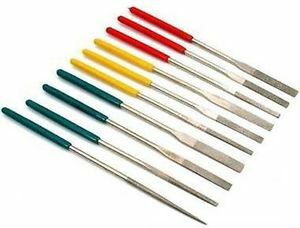 742DF 10 pc Tapered Diamond File Set Nice 10 Diamond Coated Needle Files, Dimension: 3mm x 140mm x 70mm, 3 Different Grit. Great for Filing & Cutting. Great for filing glass, ceramic, rock, carbide, gold, platinum, silver or anything else that is hard. Made of tempered stainless steel. Files quickly and smoothly since the files can cut on both the push and pull strokes. Each measures approximately 5 1/4" (133 mm) long. Contains 80 Grit: 6mm, 4mm, 3mm Flat File, 260 Grit: 6mm, 4mm, 3mm Flat File, 360 Grit: 6mm, 4mm, 3mm Flat File.